Baked potatoes are always a crowd pleaser, especially “fully loaded” baked potatoes, with bacon, sour cream, cheddar cheese and chives. We thought it would be fun to turn the traditional baked potato recipe upside down, and boy did we get some oohs and ahhs when these popped out of the oven! These are downright impressive to look at, and will definitely require a fork and knife. We wanted something that would still give us that loaded baked potato experience but on a grander scale, and to that end we decided to make baked potato volcanoes. A little creativity goes a long way, and these potatoes show how some imagination can take food to another level. 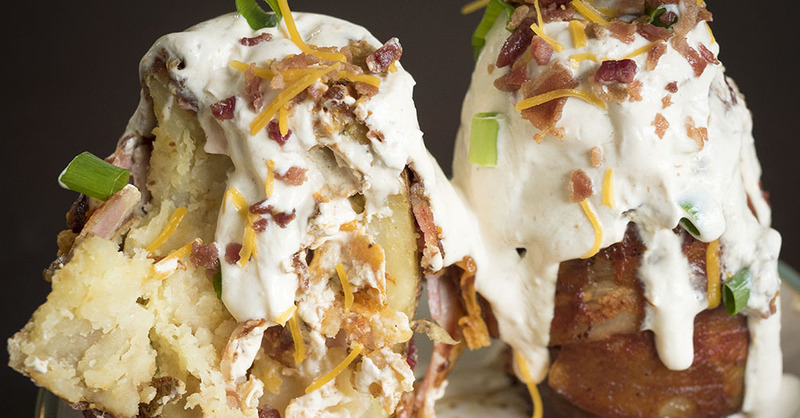 We hollowed out the baked potato, stood it on its end, and filled it with all kinds of goodness. To make it even more volcanic, we added barbecue sauce poured over the sides in an epic lava flow of flavor. Then a “snow capped” topping of sour cream (jazzed up with a little hot sauce for some heat) and we’ve got an impressive potato peak that explodes with flavor. Whether it’s for the big game or for a fun way to jazz up a weeknight dinner, our volcanic baked potatoes are definitely a hit. You’ve probably never had tots quite like this before! Use a fork to poke holes all over potato to allow steam to escape. Place potatoes in oven and bake for 30 minutes, or until partially cooked. In a small bowl, whisk together sour cream and hot sauce until combined. Refrigerate at least 20 minutes, or until ready to use. Remove potatoes from oven and set aside until cool enough to handle. Reduce oven temperature to 350º F.
Starting at the bottom of each potato, wrap bacon around the base and up to the top. Secure with toothpicks. In a medium bowl, mix together scooped out potato and turkey slices. Add one spoonful turkey mixture to the inside of potato and top with a pinch of cheddar cheese. Continue layering until potatoes are full. Top with any remaining cheddar cheese. Place potatoes in oven and bake for 30 minutes, or until potatoes are heated through and cheese is melted. During last 5 minutes, brush on preferred barbecue sauce. Remove potatoes from oven and drizzle sour cream mixture over the top and let it drip down the sides. Top with green onion and serve immediately!